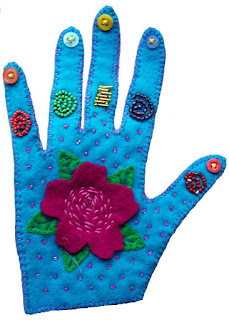 So a few years ago, I did a project where we traced round one of our hands and then embroidered and embellished it with buttons, beads, felt shapes and embroidery. Everyone loved doing this project and this is the hand I made back then. This month I decided to revamp this project and mindful of the ladies I am working with I have been thinking a great deal about what meaning there could be behind it. I know I would be lost without my hands....they feel, they touch, they tell people you care, you use them to create things, make music, express your emotions, speak without words and for some they are a means of identification. I have created a handprint of my own hand, cut out of felt and embroidered with symbols that mean something to me. This is what we will do in week one of this two-part workshop using felt, buttons and embroidery. 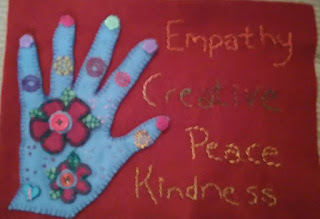 The second week we will attach it to a piece of felt and embroider positive words or affirmations that will encourage you whenever you look at it. The words I have chosen are ones which I have a particular affinity with. Empathy: I care very much for the people around me and those I work with. Particularly at the moment with the ladies I'm working with at Petrus, who have very challenging lives. Creative: Creativity plays an important part of my life, so that word of course has to be there. Peace: Well, we all need some peace in our lives. We all live very stressful, hectic lives these days, but I am mindful that I need some peace and quiet to create a balance. Kindness: I am often appalled how nasty the world has become. People use the excuse they are "just being honest". when actually they are just being extremely rude and ill-mannered. I make a point of being kind and saying postive things to the people I meet, as sometimes it's been said I've been the "only person who's had a kind word for them all day". and you never know but it might make all the difference.